Weather in Bali is becoming increasingly hot. The sun is shining bright all throughout the daytime. It has become difficult to go out during the afternoons. Students prefer to play indoor games due to the hot weather. Temperatures have shot up to 2°C to 3°C. Highest was recorded at 42°C and lowest at 29°C. Humidity was at 17% and the wind blew at 10km/hr. Saturday, 25th April: The students of the Social Service League are once again in the full swing. The students were seen cleaning the School Campus. They were seen picking garbage, collecting weeds and bits of paper to make the campus clean. The students of Eco Club watered the plants. Thank you students. And ends with friend I Love You. We can fight any battle. They always help us in any case. But I lost her in one accident. If it was in my hand. Saturday, 25th April: The first sports activity of the session 2015-16 for the Senior Section was organized. Inter House Volleyball Match was organized for the Senior Section. . In first match, Teresa House beat Gandhi house and reached finals. And in the second match Dhyanchand House defeated Raman House and reached the finals to play against Teresa House. For the 3rd position Gandhi House defeated Raman House in a very close match. Monday, 20th April: To improve the reading skills and vocabulary of the students DEAR program was conducted in all the classes. Tuesday, 21st April: Hindi is as important as English Language, so Inter House Anuched Lekhan was organized for the students of Class VI- XII. The students were given the topics on the spot. The students were given half an hour to do their work. The students put up a wonderful piece of work and exhibited their creative and writing abilities. Wednesday, 22nd April: A Special Assembly was organized on the occasion of World Earth's Day. Several students delivered speeches, articles and sang songs on this occasion. Dhavan Choudhary/III A/TH; Punit Dave/III A/RH; Himanshi Rajpurohit/IIIA/RH; Yukti Kansara/IV B/RH; Aman Singh Dalawat/VII A/RH; Vinita Sirvi/VIB/GH; Khushi Rao/X A/GH; Priyank Rathod/X A/DH; Divanshu Bhati/X A/GH; Pooja Dutta/XI/GH all contributed to raise awareness on saving earth. To bring awareness among the students the importance of electricity, lights were switched off in all the classes for an hour from 9:00 AM to 10:00 AM. Students made beautiful posters in the Social Studies and EVS Classes. The theme was to Save Earth. The posters were displayed on the Display Boards. Saturday, 25th April: Saturday observed an Activity Day. In the first hour all Clubs met. 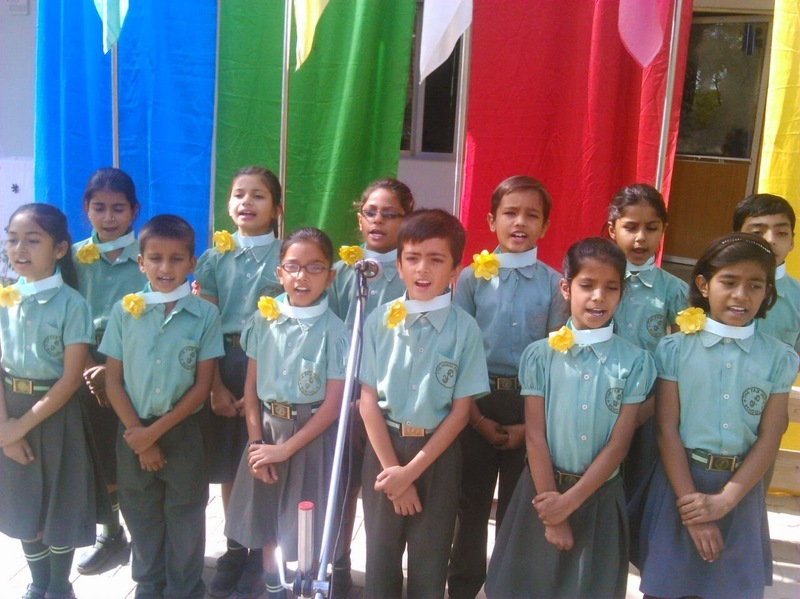 Inter House English Recitation Competition (Junior) was organized for the Primary Section . The Competition was organized for two Groups. In Group A the students of Class I-II participated. In Group B the students of Class III- V participated. The judges for the Competition were: Ms. Kusum Sharma (Junior Coordinator), Mr. Hitendra Singh (HOD English) & Ms. Bharti Rao ( Senior Coordinator). The Competition started with a group song presented by students of Class IV. There were eight participants from each group, two participants from each house. The students were wonderful and put up a good show. Aryan/ VI anchored the show. The rest of the school attended Indian Classical Vocal Music Classes, Western Vocal Music Classes, Stitching Classes, Computer, Art and Craft and Sports Classes. Bali once again experienced a change in the weather. The whole week the weather was clear, hot and sunny. Afternoons were so sunny that it had become difficult to go out in the sun. Temperatures have shot up to 7°C to 8°C. Highest was recorded at 39°C and lowest at 27°C. Humidity dropped down to 15% and wind blew at 11 Kms./ hour. Monday, 13th April: Ms. Barbara Powell, an old associate of the school, who mentors leaders and has good will of the school close to her heart visited the school for three days. On Monday she was invited to address the Assembly, where she spoke of the importance of study in life. She spoke on education and how to utilize knowledge in the best way. She observed classes and gave feedback to teachers on how to improve their class delivery. She also held a workshop on Question Technique and how it can be implemented in the classrooms. There was a session of how to make Lesson Plans and the challenges faced by the school. Ed. : How do you feel being welcomed to TFS? B.P: The Fabindia School is dedicated to shape up the young minds into epitome of knowledge. And these young children have utilized their knowledge in the best way to welcome me. But I feel they will be perfect over a little more span of time. Hence, I wish good luck for their future in order to become excellent citizen of the country. Ed: What is your opinion about ‘Inclusive Education’ and how to realize it? B.P: Education will remain half done till; even a single stone is unturned. So it is necessary to understand every child’s psychology. Then the teacher would be more comfortable teaching in class and child will be more comfortable while learning. Ed. : What potential does TFS have? B.P: TFS is the brand that is facilitating education in the rural peripheries. And rural land holds a lot of potential which need to be moulded. So TFS has potential which can be moulded into world class education. Ed. : What difference do you find in the student of USA & India? B.P: Student remains student, no matter where he is- be it USA or India. The difference is made by the kind of teaching the school gives. So I feel a change is required in the nature of teaching which is in practice for ages. Ed. : How we can upgrade culture in school? B.P: I feel a lot of activities must be organized in order to give children the grand exposure so as to make them grasp the standard and mannerism of real education. Also they should be given an opportunity to connect with extended world for them to perceive that where they are lacking and what they should acquire. And The Fabindia School will surely attain that level. I have faith in them. Ed. : What message would you like to give to The Fabindia School? B.P: My best wishes for all who are the part of this system. They should grow into their capacity and bring laurel to the school. Thank You Ms. Babara Powell for all the suggestions and the advice that you gave to the teachers to make their teaching more interesting and effective. Friday, 17th April: Lemon Race was organized for the students of the Pre-Primary kids. All the students participated in the race. They had fun and enjoyed racing with the spoon and lemon in it. Saturday, 18th April: School had its first Activity Saturday of the new term. In the first for an hour there was Inception of the Societies and Clubs. Inter House Lemon Race was organized for the Primary Section. There were three participants from each Class and each House. The participants were divided into two sections: In the first section students were from Class I and II, in second the participants were from Class III, IV and V.
Tuesday, 14th April: The school observed a holiday on the account of Dr. Ambedkar Jayanti. Friday, 17th April: English Recitation Competition was organized for the students of Pre- Primary. All the students participated in the competition. The students recited beautiful English poems. Saturday, 18th April: Principal conducted an orientation session for New Teachers in the library for an hour to educate them on various activities, procedures of Admin, roles of Coordinators, HODs and Academic Deans and what the school expects out of them in their new roles. The students of Pre–Primary Section observed a holiday. PTM was organized in which only ten Parents turned up. Bali saw inclement weather once again in the week gone by. Nimbus clouds would cover the sky every day by late afternoon and brew up a storm to shed rain. Mornings remained clear and sunny while late afternoons and evening rained with lightning and thunder scaring people with its abnormal behaviour. Temperatures dropped to 4°C to 5°C. Highest thus came down to 29°C and Lowest remained at 19°C. Humidity shot up to 31% and wind blew at 11 Kms/hour. Monday, 6th April: After two weeks the School was abuzz again with student life. All students went to their new classes and the Book Store was crowded with parents to buy new books and uniform. Tuesday, 7th April: IH Handwriting Competition was held for Classes I to V. Results awaited. Two mentors from Welham Girls’ School visited the school. Ms. Paramjeet Kaur the Librarian, who holds 30 years experience inspected the school Library and guided our new Librarian Mr. Lalit Joshi in updating the library. She worked hard for three days and set up the School Library all over again. We are thankful to her for such close guidance. The School Library now looks very welcoming with lots of new space created. Miss. Kaur will visit us again in October now. Mrs. Julie Bahuguna, HOD Hindi Welham Girls’ School, held three days workshop with Hindi and English Department on Mind Mapping and innovative teaching in classrooms. Teachers were given some task to follow up while she is away. Now the HODs will carry on the follow up. Mrs. Bahuguna will do monthly Skype calls to take briefs from HODs and visit the school in October. The School thanks the Principal Mrs. Jyotsna Barar for sending help to school and for teachers who have really made a difference. A special Assembly was organised for World Health Day. Since it was Class XII’s turn to take Assembly, Kushagra Singh/XII/TH and Bajrang Singh/XII/TH spoke on tips to keep healthy with food and exercise; develop habits that kept their minds ticking and their bodies nourished. Wednesday, 8th April: Ms. Julie Bahuguna was invited to address the Assembly, where she spoke of the importance of language in student life. She spoke on commonality between the two languages and how if students refined these two languages they would do well and make fewer mistakes. She also gave few tips on how to spell words though sounds. Saturday, 11th April: Ms. Barbara Powell, an old associate of the school, who mentors leaders and has good will of the school close to their heart visited the school for three days. On Saturday, she went around the school, escorted by the Principal to see changes that have taken place since 2011, when last she was here. She found the changes developmental and pleasant. On the same day she met the staff over lunch, followed by a short meeting on introduction of new teachers and a feedback by teachers on their new assignments. School welcomes Mr. Hitendra Singh Chundawat (English Dept), Mrs. Kusum Sharma(SST Dept), Swati Sood (PA and HR), Mr. Rajendar Sharma (Estate officer), Mrs. Rakhee Bhatnagar (PRT), Mr. Lait Joshi (Librarian) and Mr. Taun Mishra (PTI) to The Fabindia School fraternity. We do hope they all have a rewarding tenure and contribute their strengths towards building the school to a higher level.